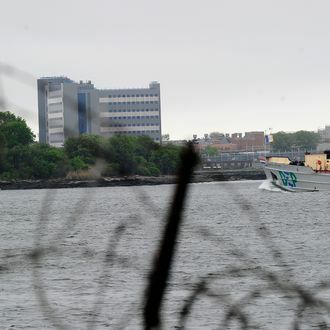 New York authorities have been cracking down on illegal behavior at Rikers Island following the death of two inmates earlier this year, and on Wednesday they made three more arrests. Department of Corrections Captain Moises Simancas and officers Tyrone Wint and April Jackson allegedly handcuffed an inmate and beat him until he was unconscious a day after Hurricane Sandy hit. Tensions were high due to the storm, and officials say that when inmate Gabino Genao began verbally abusing one of the defendants, the three handcuffed him behind his back and pulled him into a stairwell. After Genao ducked to avoid a punch from one of the officers, he was allegedly pushed to the floor, and all three punched and kicked him, striking him several times with a baton. All three have been charged with first-degree attempted assault, which carries a maximum of 15 years in prison. Simancas and Wint were also charged with filing false reports, which could add four years to the sentence. “The victims here were not simply the injured inmate but the justice system itself, which cannot properly function when sworn law enforcement officers falsify documents to cover up crimes,” said DOI Commissioner Mark Peters.